The Faculty Artist Series presents pianist Bill Dobbins, Professor of Jazz Studies and Contemporary Media, Monday, December 3, at 7:30 p.m., in Hatch Recital Hall, at the Eastman School of Music. Bill Dobbins is professor of jazz studies at the Eastman School of Music in Rochester, New York, where he teaches the jazz composing and arranging courses and directs the award-winning Eastman Jazz Ensemble and Eastman Studio Orchestra. 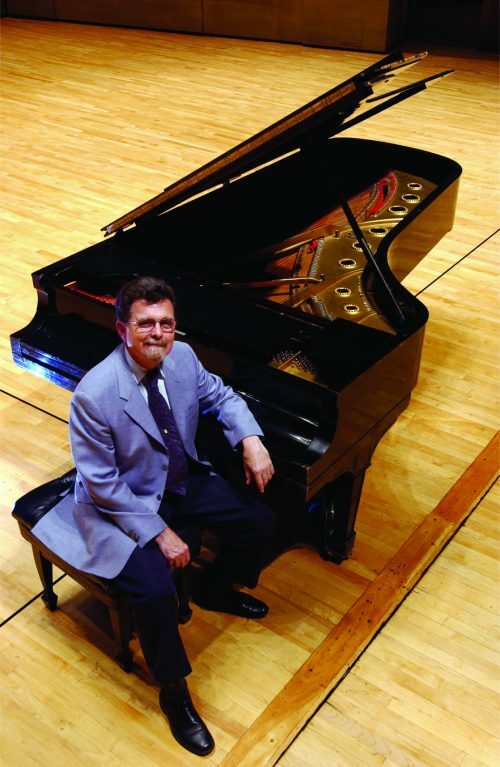 As a pianist, he has performed with orchestra and chamber ensembles under the direction of Louis Lane, Pierre Boulez, Lukas Foss, and Frederick Fennell, and he has performed and recorded with such jazz artists as Clark Terry, Al Cohn, Red Mitchell, Phil Woods, Bill Goodwin, Gary Foster, Dave Liebman, John Goldsby, and Peter Erskine. He joined the Eastman faculty in 1973 and was instrumental in designing the graduate and undergraduate curricula for Eastman’s Jazz Studies and Contemporary Media program. Many of his students have been heard in the big bands of Count Basie, Woody Herman, Buddy Rich, Maynard Ferguson, Thad Jones/Mel Lewis, Chuck Mangione, and Maria Schneider, and in Bob Brookmeyer’s New Art Orchestra. Dobbins’ Eastman program is entitled “Classical Music and Jazz: a Common Language.” The idea for the program came out of Dobbins’ lifelong love of both classical music and jazz, and the realization that the unique musical language of chromatic tonality, from which most of the standard classical repertoire from the eighteenth through the early twentieth century was composed, is also the foundation of the harmonic language of jazz. The first half of the program includes Dobbins’ own arrangements of Prelude XII in F minor from volume 2 of The Well-Tempered Clavier by Johann Sebastian Bach, the Adagio Cantabile from the Sonata, Opus 13 (Pathétique) by Ludwig van Beethoven, and the Rhapsody, Opus 79, No. 2 by Johannes Brahms. The Bach prelude is arranged in a jazz waltz style, the Beethoven adagio in a jazz ballad style, and the Brahms rhapsody in a Latin jazz style. In addition, two compositions of Frederic Chopin will be played in their original versions and paired with jazz standards that have similar melodic and harmonic features. The second half of the program includes compositions by Alexander Scriabin, Claude Debussy, Erik Satie, and Federico Mompou. The original version of Scriabin’s Prelude, Opus 11, No. 2 will be performed, along with an improvisation on its harmonic progression. An early Satie composition, Gnossienne No. 3, is arranged in a somber bluesy setting at a slow funk tempo, while his witty miniature, Celle qui parle trop (The woman who talks too much), will be played in its original version, along with Dobbins’ own blues theme that is based on Satie’s thematic motifs. Debussy’s Golliwogg’s Cakewalk (from The Children’s Corner suite) is arranged to include some improvising in the stride piano style, developed in the 1920s and 1930s from the earlier ragtime idiom. The program will conclude with Dobbins’ arrangement of Federico Mompou’s Cançó i Dansa VI, inspired by the folk music and flamenco culture of the Catalonia region of Spain, where the composer spent much of his life.